My mom has been a client of Avon since I can remember so when I became interested in make up and in those type of products I as well become their client. I’m going to be honest, Avon products aren’t really cheap but the quality is usually really good which makes the money worth it. My make up bag is full of Avon eyeshadows, eyeliners, foundations, lipsticks etc and they are all amazing, especially the eyeshadows! The only problem when buying through catalogue is that you never know what real shade is going to be and for that reason I have stopped buying there my foundations – the quality was good, but I never found a good shade for me, they were always too light or too dark and if there’s something that I hate is a foundation that looks weird on someone’s face. Anyway, those 3 products on the picture are the latest purchases I made. I actually ordered them a few days before christmas and they only arrived this week (and that’s one of the other things that I hate about Avon! The time I have to wait to get the products). 1 – Smooth minerals powder foundation. I needed a new powder to use after the foundation to settle it, and this one seemed amazing. I’m not sure about the shade but since I will not be using it as a foundation it will be ok.
2 – Sensitive botanicals. Regime trial kit for sensitive skin. I needed a new cream for my face – I’m a bit lazy when it comes to apply those type of things, I don’t really like to feel my face with it them, but since I’ve been using make up daily for a few years and I’m not getting younger I thought I had to start using something and fast; the fact that I get attacked by acne every month helped the decision as well. This trio kit has a day cream, a night cream and a gel cleanser. 3 – Bronzing powder. It says everything I guess. I really like to see my skin with a bit of glow and I hate to see me with pale skin. 4 – Glimmerstick diamonds, colour: golden diamond. I actually bought this eyeliner thinking about New Years Eve but forgot it wouldn’t come in time for that (at all!!). But I’m sure I will use it in other time. 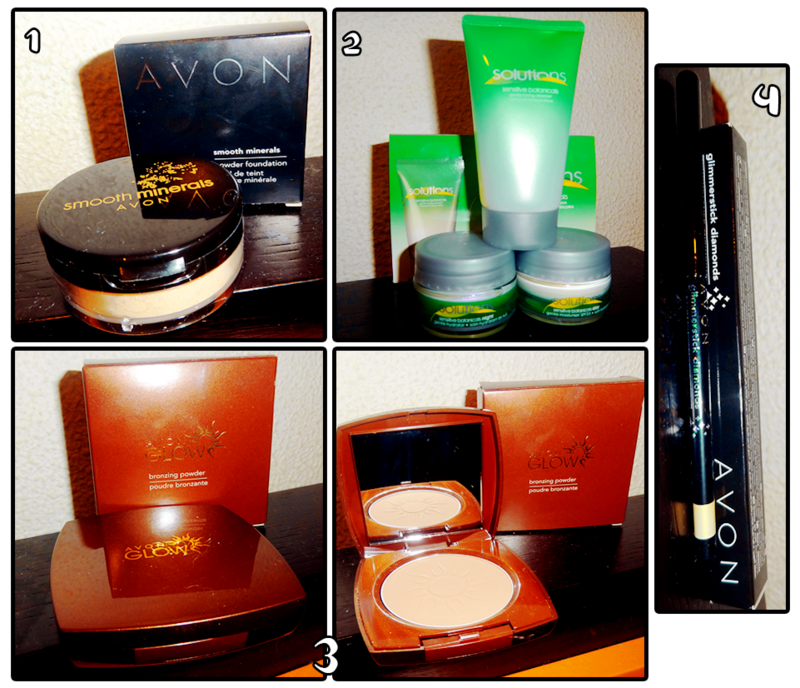 This entry was posted in Make up and tagged avon, beauty products, make up. Bookmark the permalink. why did you use a foundation to set your foundation? why didn’t you use pressed powder? just curios. I didn’t. Unless I’m wrong, but the smooth minerals is just powder (to settle your foundation you don’t have to use pressed powder exactly, you can use powder or translucent powder (which is the one I’m using nowadays since is much better). Besides, this powder is really shiny and has no coverage so I don’t know why you would use it as foundation. I own bronzing pearls as well, but they don’t do what I wanted them to, probably because they were to light, so I used my bronze pressed powder and then use a bit of the pearls just to give a bit of a glow.